Thompson pilots rookie team to podium finish in their first weekend together. ST. PETERSBURG, FL (March 15, 2017) – Exclusive Autosport made their long-awaited debut in the Cooper Tires USF2000 Championship Powered by Mazda this past weekend at the Grand Prix of St. Petersburg in southwestern Florida following a focused off-season testing program. The team enjoyed a strong outing on the 1.8-mile, 14-turn temporary street circuit, recording three top-5 finishes at the hands of veterans Parker Thompson and Luke Gabin. Series rookie Dev Gore accomplished his goal of running every race lap, avoiding the carnage that sent a dozen rookies back to the paddock with damaged race cars. The highlights of the weekend were turned in by Thompson for Race #2, where he qualified on the pole. After a spirited battle, Thompson brought the team their first podium in Mazda Road to Indy Presented by Cooper Tire competition with an impressive third place finish. Gabin added to the Race #2 success with a strong fourth place effort. “I am proud of the entire Exclusive Autosport team,” offered Michael Duncalfe, EA Team Owner. “Our staff worked tirelessly for months preparing for this event in St Pete. I feel our crew gave our drivers great cars and our drivers did a great job keeping their noses clean and finishing strong. To come away with one pole position, one podium and three top-fives is something to be proud of. That said, we are hungrier than ever for a win and to put all three of our drivers in the top-five. I can’t thank the entire EA team, our drivers, their parents and all of our supporters enough. We had a great opening weekend and we cannot wait to get to Barber Motorsports Park in April. After a Thursday afternoon practice session afforded the drivers with their first opportunity to get on-track in St. Petersburg, the team’s pilots headed into qualifying for Race #1 on Friday morning. The track was still very green, which made it tough to find grip and balance on the cars’ setups. Thompson led the way for Exclusive by laying down the sixth quickest time of the session to secure a position on the third row for the first race of the doubleheader. Gabin was just inside the top-10 in 9th, while Gore knocked almost three seconds of his practice time to begin the official weekend, improving greatly his pace to finish up 21th. Both USF2000 races were held on Saturday, so the drivers needed to balance the aggression of racing for the win and making sure they avoid damage that could take them out of Race #2. In the opening race, Thompson battled in the lead group and eventually topped a spirited battle between three drivers to take fifth to begin the season. Gabin fought for a position inside the top-10 and ended up 11th while Gore took another step forward with his on-track pace to finish 17th. Qualifying for the second race had taken place on Friday afternoon, and Thompson put it all together during the 30-minute session, earning Exclusive Autosport their first MRTI pole position. Gabin lost a bit of pace, getting caught in traffic on his sticker tire laps, and was 11th in the timed run. Gore dropped over a half-second from Qualifying #1 to Qualifying #2 and advanced up the order to 19th. Thompson paced the field to the Race #2 green flag early Saturday afternoon where he led 10 out of the 21 race laps. At the midpoint upon a restart (after a long full-course caution), Parker misjudged the grip slightly and pushed past the apex of turn 1, dropping to fifth in the running order. The result was an early-race battle with Kaylen Frederick. 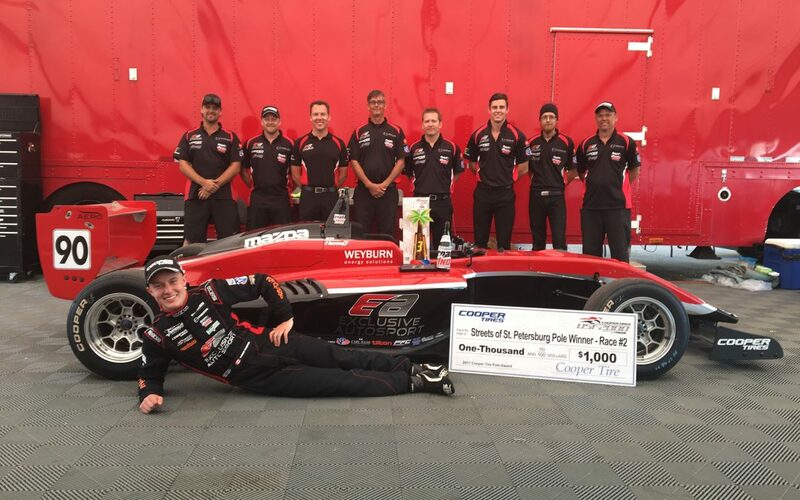 Thompson was able to manage the competition and power to a third place finish, giving the team their first podium in USF2000 action. The crew dialed in Gabin’s USF-17 as well, allowing him to storm from his 11th place starting position to fourth at the end of the 30-minute race. It was an impressive performance that will give the Aussie the momentum he needs heading to Alabama in April. Like Gabin, Gore saved his best for the final race of the weekend, finishing 16th. The next event on the Cooper Tires USF2000 Championship Powered by Mazda is set for the beautiful Barber Motorsports Park in Birmingham, Alabama on April 21-23.